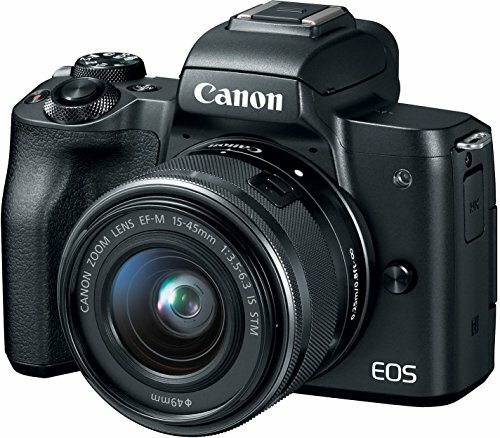 Since Canon launched its mirrorless camera line-up - known as the EOS M range - we've failed to be too impressed. The EOS M50, however, could be the camera to change that. Why? The M50 is the first time we've seen a number of things in this range: there's a new user interface that's accessible for beginners but has more depth for those who want more; there's 4K movie capture for the first time in any consumer-level Canon camera; and the combination of built-in stabilisation, an easy-to-use touchscreen and viewfinder give the camera broad appeal. At the same time, however, its autofocus system isn't as detailed as its Panasonic Lumix G competition, while the range of EOS M lenses in Canon's stable is somewhat limited. It marks progress, yes, but in a market where, despite its name, Canon still can't quite offer the leader of the pack. Canon is cramming a lot into the small-scale body of the M50. Unlike its smaller M100 cousin, the M50 includes both a built-in electronic viewfinder and a vari-angle LCD touschreen too. The viewfinder has eye-level detection for rapid auto-start, while the screen's side-positioned bracket makes it very easy to use - just how we like it. After using the M50 for just moments, our biggest note was the user interface system - it's changed, for the better, to be more in-line with Canon's Guided UI interface (as found in the EOS 200D and EOS 800D, for example). Its designed to do a little bit of hand-holding to aid newbies learning the ropes about which modes do what and how, via visual prompts, while deeper menu digging provides access to deeper controls just as you'll find in other Canon DSLR cameras. It's not over-simplified like the M100's interface. But just because the M50 is designed to ease people into photography, doesn't mean it's holding back when it comes to features. There's a 5-axis image stabilisation system, the likes of which you'll find in the higher-ranged (and pricier) M5 and M6 models. There's Wi-Fi and NFC connectivity, plus an app update that can facilitate auto-forwarding of images to a smart device. All that's really absent is a hardier build quality - but that's available further up the range. In terms of performance, the EOS M5 is fairly typical of Canon's EOS M range. Its Dual Pixel CMOS AF autofocus system has the smarts to be snappy, but it'll depend on the mode that you have selected as to how well that'll assist. With single autofocus set, it's possible to use Face Detection tracking and even Eye Detection for ensuring sharp portraits to the eyes. Subject movement, however, can outsmart the system - and then it's not quick to override it and choose different settings. Canon's competition, such as the Panasonic Lumix G, offer a wider variety of autofocus types, controls and point sizes that are absent here - which is and has been a limitation for some time. That said, with the camera put into continuous autofocus a blue grid will light-up on screen, actively showing what's being followed for focus, rapidly updating as subjects move. It's rather proficient thanks to this system. Burst shooting is pretty rapid, too, at up to 10 frames per second. When it comes to image quality the M50 doesn't cut corners, using a 24.1MP sensor - the same resolution as you'll find higher up the M-series range. Here it's paired with Digic 8 processing (the first time it's appeared in any Canon camera) which gives slightly more grunt to processing - although, by eye, the results look largely the same as you'll find elsewhere in the EOS range at this resolution. We took a handful of snaps of dancers, dim-lit props and surroundings and, by and large, found the quality to be decent - although at 100 per cent scale in the higher-sensitivity (ISO 6400) settings there's a lack of bite to detail and colour wanes a little. Bigger news, however, is that Canon has - finally! - taken the plunge and introduced 4K capture (that's Ultra-HD resolution, 3840 x 2160) in a consumer-grade camera. There's even a microphone input, which may appeal to vlogging types. We didn't think that was going to happen any time soon, but here it is, pride of place in the M50. Surely Digic 8 and 4K a sign of the things to come across the wider range in the future. The Canon EOS M50 may be positioned one-up from the entry-level M100 model in Canon's mirrorless line-up, but it spells the future of what to expect from the M-series line-up. With 4K, an easy-to-use interface, plus various desirable features including image stabilisation and a viewfinder, it'll have plenty of appeal to a broad range of users. That said, Canon still can't outsmart all of its competition when it comes to autofocus variety, lens range expanse, or overall feature set. So while the M50 marks the beginning of a new mirrorless drive, it's still not quite king of the hill. The Canon EOS M50 will be available from March 2018, priced £540 body-only / £650 with the 15-45mm lens.